India: Young at 60! A Great Track Record and a Bright Future! This month, India and Pakistan celebrate their 60th anniversary of independence. We all look toward a bright future for our peoples. The track record of India as a modern political unit is good, and Indians' steadfast allegiance to the unity of their nation, political democracy, and the welfare of all sections and classes of society is amazing. We've been greatly blessed by far-sighted leaders. Leadership counts, and will continue to count for any nation to prosper. 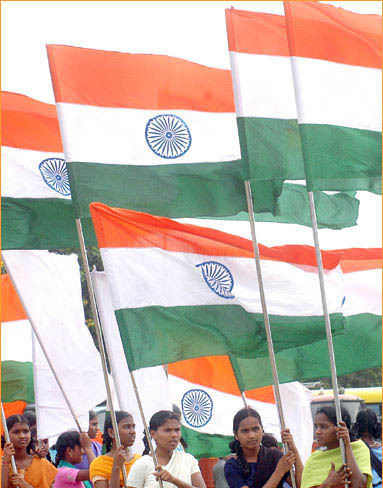 That India is a multi-ethnic, multi-religious, and multi-linguistic political unit is recognized. Amidst its diversity lies the age-old unity: unity in thought and higher culture. India is a civilization willing to absorb everything fine and noble in every culture and nation. Our prayer is that the nation will remain so forever and forever. Having said all these in praise of our democracy and political and geographical integrity of India, we also need to look at issues that continue to plague the progress and development of India, especially in the areas of ethnicity and language, our primary concern in this journal. The most serious crime that is yet to be rooted out is ethnic killing in several parts of India. Recently Hindi-speaking people were and are being targeted as victims of this heinous crime in Assam. Kuki-Naga clashes in Manipur and Naga Hills is yet another sad story. Ethnic discrimination is somewhat under control, and this is obvious in the diverse ethnic representation of men and women in armed forces and civil and business services throughout India, and even in the representative character of Indians migrating for jobs to western and other nations. And yet a fair distribution of available slots is still a long way to reach, since such decisions are governed by many factors, not merely ethnic and linguistic orientation. Discrimination is quite different from killing. Such killings basically question the overarching concept of India as a nation, and the freedom and liberty of Indian citizens to seek their livelihood in any part of India if they choose to move from their original places of birth. As more people receive the benefits of modern India and receive better education, mobility of all classes and ethnic groups will become the most natural thing in India. It is already happening. While centuries ago, mobility was mainly encouraged by the spread out of pilgrimage centers, the expansion of British Raj within Indian territory and the cities that emerged due to this rule encouraged both domestic help and other professionally trained people to move from their original places of birth and education to far off places in all directions. Earlier to British Rule, the Mughals also contributed to the phenomenon of mobility, not to mention the contributions of the great Vijayanagar Empire in the South. Along with this mobility also came ethnic prejudices, stereotypes, and discrimination. That Indian heritage always had its own share of ethnic prejudices and stereotypes can be easily gleaned from Natya Sastra, and several other classics. Our proverbs and perceptions also reflect our prejudices, stereotypes and discrimination. Movies in the past had their own share of contributions in this regard. Linguistic Reorganization of the States within the Indian Union did not result in exclusively monolingual territories. The Reorganization recognized the pre-eminence of traditionally and historically resident and dominant linguistic group/s within a territory. For example, carving out the province of Andhra Pradesh did not result in exclusively monolingual state of Telugu speakers. In fact, no state is exclusively monolingual in India. Indian territories have evolved to be multilingual for centuries. And along with this, a sense of tolerance and acceptance for all linguistic groups within a territory, while recognizing the pre-eminence of a dominant linguistic group within that territory, was subconsciously embedded in our psyche. Linguistic Reorganization of the states in India has actually increased the responsibility of the state governments and ruling political parties to ensure the safety and progress of ethnic and linguistic minorities within their boundaries. The recognition that not all ethnic groups and linguistic groups are recent innovations should enable us to develop a sense of fairness toward all. At the same time, that all of us are equal before law and that the ethnic groups also form bona fide people groups of citizens of India within a linguistically organized state should ensure fair play. It is also important for ethnic and linguistic groups within a state to recognize the pre-eminence of the dominant linguistic group in the cultural and secular affairs of the state. Insistence on exclusive treatment based solely on ethnic identity will work against the interests of the nation and the territory in which these ethnic groups live and prosper. Many a time, in the name of ethnic and linguistic minority status, attempts are made to thwart the implementation of the official policies relating to education and administration. While some High Courts have held that the administrative convenience of the states should take precedence in matters of language choice, etc., for their population including ethnic and linguistic minorities, others have not yet come to that decision. Another important point is that often we seem to assume greater similarity between different ethnic and linguistic groups with a pan-Indian perspective that calls for suppression of visible differences. We need to recognize that there are differences in approaches and communication styles between persons hailing from different linguistic and ethnic groups. There are barriers to proper, meaningful and effective intercultural communication within India. These may be described as follows: assuming similarity instead of difference, ethnocentrism, stereotypes and prejudice, nonverbal misinterpretations, and (diversity in) language and language use. Great Metropolitan cities such as Kolkata, Delhi and Mumbai have evolved their own communication orientations that are quite different from orientations even in large cities such as Pune, Chennai, Ahmedabad, Bangalore, Hyderabad, etc. While ethnicity and linguistic identity may still operate effective at several levels of the population in the mega cities listed first above, importance of such identities become apparent mostly when crises develop. Dynamic Changes in Composition Is Near Us Now! The next decade will bring greater changes in the linguistic ethnic composition of many cities and leading states. Hopefully, we will continue to be blessed with a leadership that looks forward positively toward the future that lies ahead.